Pronunciation can sometimes be so important. Take Japanese as a language of example. In many ways it is infinitely more logical than English, as words are constructed of syllables that are always pronounced the same way in every word. So if you see the character for 'he' (pronounced 'heh') then you'll always know how to say it, no matter what letters follow or precede it. But you have to watch out for those emphasised vowels, represented in Romaji (the western textual interpretation of Japanese characters) as a straight line above the vowel in question. They elongate the vowel and change 'ho' (pronounced as a clipped 'hoh') to 'hō', where the 'o' is held for just long enough to alter the sound of the word. I have a Japanese friend on whom I rely for background information on older Japanese films, particularly the actors, source novels and legends on which the stories are often based. When the latest two Mizoguchi films arrived from Masters of Cinema, she was keen to know the titles. "Akasen Chitai," I told her, to which she raised an interested eyebrow, "and Yokihi," which prompted only a shrug. She'd clearly never heard of it, much to my disappointment. I should add in my defence that I was reading the title directly off of the review disc, items that rarely include special characters or accents. I handed her the press notes in the hope that it might jog something and her reaction was immediate: "Oh you mean Yōkihi!" The difference in the pronunciation of those two words may be minute to western ears, but for my friend it separated a collection of essentially meaningly syllables from the title of a famous story, one that she assures me is so beloved in some quarters that pictorial representations of it have found their way onto the backs of Yakuza gangsters as colourful tattoos. Yōkihi was one of Mizoguchi Kenji's final films and one of only two that he made in colour. It's further distanced from his earlier work by virtue of its Japanese-Chinese co-production status, employing Japanese actors and staff to tell a story set in the country of the tale's origination. In 8th Century China, the grieving Emperor Hsüan-tsung is still mourning the death of his beloved wife, but members of the politically ambitious Yang family are searching for a new bride from within their own ranks. Their co-conspirator, the Turkish general An Lu-shan, finds the girl they need in the shape of Yu-huan, a lowly kitchen maid from a distant arm of the family who bears a striking resemblance to the Emperor's previous wife. Cleaned up and presented to the court, she envies the Emperor's love for his dearly departed, while her honesty and affection soon proves endearing to him. It's only a matter of time before the Emperor falls for Yu-huan, and under her new name of Yang Kuei-fei (Yōkihi) she is raised to the position of first concubine, and the Yangs are given key ministerial roles, positions of power they quickly abuse. The country is thrown into turmoil and the Yangs become targets of popular dissent and revolt, having already made an enemy of General An after he was not given the ministerial post he was promised. Yang Kuei-fei is seen as a symbol of her family's corruption, and it becomes clear that only her removal will unite this now divided country. Historical dramas were not exactly new to Mizoguchi – his most celebrated works are almost all jidaigeki period pieces – but this is the only Mizoguchi film I've seen that I would risk labelling a costume drama, and I do so with a full awareness of the baggage that label carries. Part of this is due to the setting, with the dealings of the Chinese Imperial court not having the same empathic hold as the suffering of poor families displaced by civil war (Ugetsu monogatari) or even those whom circumstance has torn from grace (Shanshō dayū). 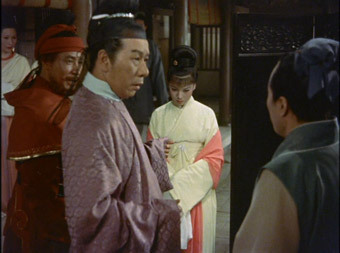 But in other ways the story fits well within the Mizoguchi canon, particularly in the figure of Yang Kuei-fei herself, the innocent of the piece whose unjust fate is sealed not by her own actions but by those of corrupt and self-serving others. Although Mizoguchi's first non-monochrome feature, the use of colour is sometimes striking and, we are assured, the result of the director's particular fascination with this aspect of the production. As a dramatic piece, however, it lacks the drive and character depth of the jidaigeki films for which he is rightly celebrated. It's all a matter of taste, of course, and there are those that regard this as an exquisite and finely tuned work that sits high within Mizoguchi's extraordinary oeuvre. 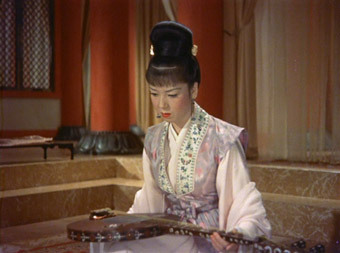 But although many of his earlier fims incorporated elements from Japanese noh and kabuki theatre, for me this is the only one that has the air of a filmed stage play – an interesting stage play for sure, but not an enthralling one or one whose characters invite the sort of emotional bond that I usually associate with this particular filmmaker. Even the MoC package itself provides an interestingly diverse view of the film, with a detailed essay in the accompanying booklet by Mark Le Fanu extolling its virtues coupled with a video introduction in which Tony Rayns is dismissive of its dramatic flatness. My Japanese friend, for the record, rather liked it. If you take the four Masters of Cinema Mizoguchi double-bills as a guide, you could be forgiven for thinking that, with the above exception, the director only made two types of film – jidaigeki period pieces in which the lead characters fall victim to misfortune and tragedy, and contemporary dramas set in the world of geishas and prostitution, stories in which conflict and adversity are usually blessed with a glimmer of hope for better things. 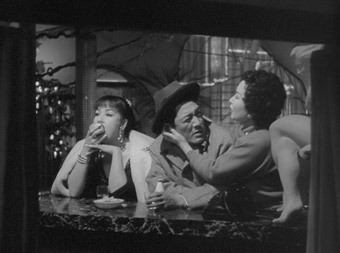 Following his experiments with colour in Yōkihi and Shin heike monogatari, Mizoguchi, for what was to prove his final film, returned to black-and-white and the world of the contemporary prostitute. Although bearing a number of stylistic similarities to his previous contemporary geisha/prostitute stories such as Uwasa no onna and Gion bayashi, Akasen Chitai [Red Line District] is a more ambitious work that gives equal attention to five main characters, all of them based at a house known as Dreamland located in the district of the title. The sought-after Yasumi is in it for the cash and sidelines as a money lender to the other girls; the widowed Yumeko works to support a son who now rejects her help; the older Yorei plans to marry and leave the profession; Hanae works to provide food and medicine for her young child and tubercular husband; the brassy young Mickey appears to actually enjoy the lifestyle and the attention it brings her. This character variance makes for a more diverse portrait of Japanese prostitute life than the director's previous geisha-house films, and also reflects his own conflicting attitude to the lifestyle – although he remained bitter that his sister has been sold into prostitution to fund his schooling, he was a regular user of prostitutes himself (something that was in no way unusual at that time in Japan for a man of his station). This diversity is extended to our varying sympathies for the five women, representative as they are of different aspects of contemporary prostitute life. Career choices are severely limited for the poverty-trapped Hanae, a woman struggling to support a young child and a seriously ill and suicidal husband, and her income is all that keeps the family from slipping into destitution. She is a symbol of Japan's hidden underclass, criticised for her unkempt appearance by manager Tatsuko and questioning how Japan can be called a civilised society when she can't even afford to buy milk for her baby. 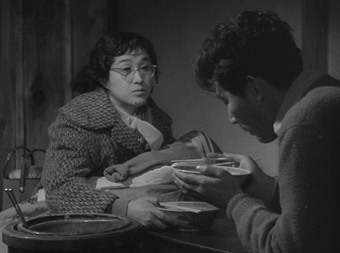 At the other end of the scale is Yasumi, whose manipulative entrepreneurialism is building her a tidy sum through the interest she charges the other girls for loans, her ruthless exploitation of Dreamland's haberdasher, and a client's doting delusion that the two will run away together, a strategy that leads to a collapsed business, embezzlement and desperate confrontation (typical of the film's layering, her late-revealed back story and end-of-film coda puts a different spin of all this). And though Yorei may look forward to her impending departure from this profession, the road there is paved with bumpy reminders of her age and her future prospects within it, losing to Mickey a long-standing client who tells her that he "has the right to choose the freshest fish." Muzuguchi's own dual view of the profession as one he was happy to use but would not want his own family to work in (a not uncommon male view at the time, I would imagine) is keenly felt in Yumeko, a woman who worked to fund her the schooling of a son who is now painfully ashamed of her, meeting her out of sight of his co-workers and then only to cast her from his life. Mickey, on the other hand, is a symbol of changing times, self-confident and westernised and for whom prostitution appears be an act of rebellion against a father she holds in contempt, whom she later confronts in one of the film's most startling and telling scenes. Issues of public perception, social status and male hypocrisy are brought to a head and climax with Mickey humiliating her father with verbal mockery and an aggressive come-on that she promises will be "the last word in debauchery." After tearfully ejecting him she returns quickly to character. "I'm going to have a bath," she announces, "and watch a Marilyn Monroe film." Such busy cross-cutting of stories requires assured handling if the audience (particularly a non-Japanese one) is going to keep track of the progress of each, but that's never an issue here, as despite the more complex structure, this is Mizoguchi on favourite turf and in confident command of his characters and narrative. A framework is provided for the open-ended structure by the fourth reading of the anti-prostitution bill in parliament, a true-life event that on its fifth reading just two years after the film's release saw legal prostitution come to an end. The busy structure and crossover of story threads drives the film forward at a pace and you'll need to be concentrating to keep up with it at times, despite the director's signature use of long-held shots, and the performances that walk an expert line between melodrama and almost documentary naturalism. The most unexpected component has to be the electronic elements of Mayuzumi Toshirō's varied but sometimes experimental score, whose unsettling Theremin-like warbles will be more familiar from late 50s American science-fiction movies than contemporary Japanese dramas. The general opinion, despite the overall quality of Mizoguchi's body of work, is that his jidaigeki films were where the masterpieces lay. I'm not about to dispute this, but I have a particular fondness for his contemporary geisha/prostitute dramas, for their storytelling energy, for their ability to look at a situation from a variety of angles, and for the delicate balancing act they play with hope and despair. For my money Akasen chitai is the most perfectly realised of these films, and in that respect it deserves to sit up there with the greats. Both films are framed in their original 1.37:1 aspect ratios and have undergone restoration. The print of Akasen Chitai is very clean and free of jitter. Contrast is good if not quite as punchy as the best transfers of films from this period, but shadow detail is excellent without drifting more than a notch or two from solid black levels. Yōkihi is in slightly less impressive shape, with some damage still visible, blacks sometimes slipping into blue, and the occasional bit of light leakage creeping into frame edges. The imperfections are particularly evident in the final scenes. Detail and frame stability are good, however, and the colours are sometimes vivid. The mono soundtracks of both have an inevitably restricted dynamic range expected of films of this age, but Akasen Chitai is otherwise clear and free of damage noise. A slight background hiss is audible but not intrusive. It's a similar story for Yōkihi, though there's a louder background crackle here that jumps in volume briefly about 66 minutes in. A typically useful intro from Mr. Rayns in which he explains the title, gives details of how the production came to be and how it fared on its release. He's clearly not a fan of the film, clearly indicated by the title card that states "At least it's in colour." An intriguing teaser that really pushes the fact that it's in "a luxurious, gorgeous Oriental colour scheme." Given the prime extra feature detailed below this may seem a little redundant, but it is designed as an introduction, while the commentary is meant to be listened to after the film. There is some minor crossover between the two, but there is plenty of information here not supplied in the commentary. The extra we've been waiting for in this series, an audio commentary by Asian cinema expert Tony Rayns that is absolutely packed to the gills with background detail on the film and the society in which it is set. His reading of scenes, characters and Mizoguchi's approach proves a fascinating masterclass in the film's sophistication of theme, character and technique. Another fine and well produced MoC booklet, this one featuring detailed essays on Akasen Chitai by Keiko I. McDonald and Yōkihi by Mark Le Fanu, a piece entitled Yōkihi: The Film and Legend by Nakagawa Nasako, the poem Ch'ang hen ko (A Song of Unending Sorrow) by Po Chii-i, which was the key inspiration for Yōkihi, and a tribute to the director by other filmmakers. Two late career Mizoguchi films that are as different a pairing as you'll find in the four Masters of Cinema double-bills, of which this is the last. I can't admit to being a big enthusiast for Yōkihi, but Akasen Chitai is one of the director's most complex and rewarding films and is absolutely worth owning this release for alone, with Tony Rayns' commentary the icing on the cake. Recommended.